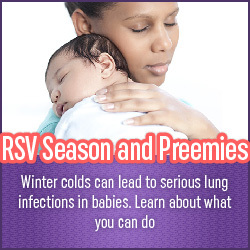 RSV or ‘Respiratory Syncytial Virus’ is common especially during the winter season. RSV makes infants ill and it has become the leading cause for infant hospitalization. Babies under 2 years old are in more risk of getting sick with this virus. However premature babies are in danger as their underdeveloped lungs are not so strong to fight with RSV. As parents you can help prevent this RSV and protect babies from it. 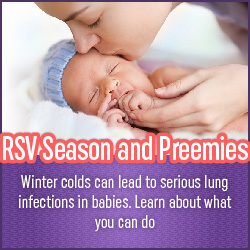 First know the symptoms of RSV such as common cold, persistent coughing or wheezing. Babies will show the signs of gasping breaths. If you notice these symptoms, seek medical advice as soon as possible. RSV is spreadable easily through activities such as touching, sneezing and coughing. You can help preventing RSV by washing their hands properly. Keep the toys, clothes and other such items clean always and keep your infants and babies away from crowds especially during the RSV season. Take one more step further to help prevent this RSV by helping for an investigational drug. Join with other parents with high risk infants, who are supporting a nationwide clinical study to research on a drug to prevent serious lung infection which is caused by RSV. Available only during the RSV season this study is named as NURSERY Pre-Term. If your infant is preterm and under 6 months, he or she is at high risk of RSV. Check HealthyPreemies.com and see more details on how you can join with the community to help protect babies from RSV.